The FLECKTARN (Woodland) Camouflage Pattern has been adopted by the Bundeswehr (Germany Armed Forces) in 1990 after the reunification of the National Military Forces of Germany and the integration of the East-German Armed Forces (Nationale Volksarmee). 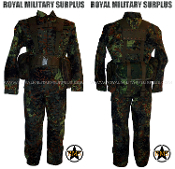 This camouflage pattern has been developped by the Federal Republic of Germany since 1975 and tested in many Colours & Shapes Variations in order to replace the OD Green standard uniforms. The Bundeswehr-Flecktarnmuster is based on the Flecktarn B version and is primarly designed for Temperate Woodland Environments. Also called "Spotted Camouflage" camouflage, this camouflage is based on a Five-Color pattern (Dark-Green, Light-Green, Brown-Grey, Red-Brown & Black) and generate a "Dithering Effect" by using small spots to eliminate hard boundaries between colours. 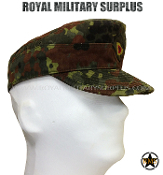 It was approved for all branches of the German Military Forces (Heer/Lufftwaffee/Marine) and widely distributed after 1990. Currently in use by German Military & Security Forces (Variations of this camouflage are in use in multiple European and International armies around the world). 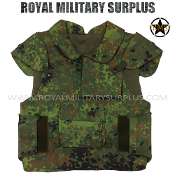 The Canada based Royal Military Surplus online store offers range of quality Military Kits, Combat Uniforms, Tactical Apparel and Military Gear in FLECKTARN (Woodland) Camouflage Pattern.